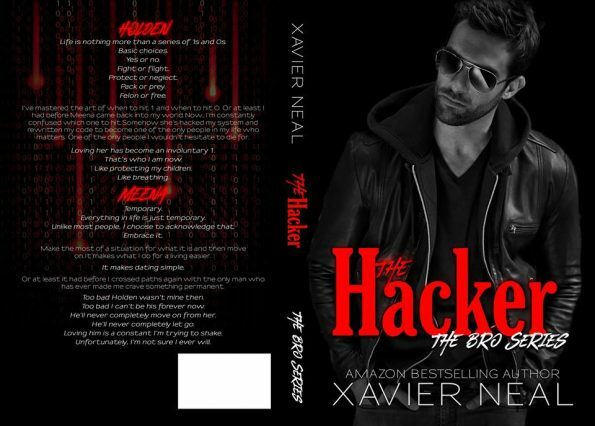 I was lucky enough to receive an ARC of Hacker by Xavier Neal. I really enjoyed this story. I always find Xavier Neal writes in a style that is easy to fall into and has me captivated. Her stories are always a great pick me up. Hacker released today and here is my review…. Hiring a blast from the past, in the form of Meena, changes everything for Holden. Can he embrace the changes or will those changes throw his mind into turmoil? Will he let go of some of the control and give his children, and himself, the future, they deserve? Another fabulous read from Xavier Neal. I always find her books easy to slip into and hard to put down. Her characters always pull you into their story and hold you hostage, hanging on to their every word. Hacker is no different, Holden and Meena are both intriguing characters that I wanted to know better and needed to follow their story. Holden is the guy who keeps everyone safe. The safety of his family and those he cares for are his main priority. In doing so he forgets about himself, and finding his own happiness. He’s loyal, strong, clever, witty and not afraid to do whatever it takes to protect those he loves. Meena is a ray of sunshine, she’s strong, caring, thoughtful, loyal and takes her job seriously. She doesn’t do her job with half a heart, she pours her whole heart into it. She has a way of bringing out the best in people and rather than face a heated discussion she can with a little encouragement and understanding get them to see an alternative point of view. She not only gave Holden’s children the best care and support any Nanny should, she also, subtly managed to coax Holden into enjoying life too. Hacker is a beautiful and intriguing read, perfect for all suspense romance readers. Hacker is part of the Bro Series; however, it can be read as a standalone.